Attending traditional Anglican services and using the Book of Common Prayer there, as well as personal use of "The Divine Hours" (Phyllis Tickle) and "Common Prayer: A Liturgy for Ordinary Radicals") (S. Claiborne et al), and recent exploration of Centering Prayer (see Cynthia Bourgeault), leaves me with the feeling that in the tradition I was raised in we missed out to some degree on the possibilities of prayer. We prayed a lot--at home we had "grace" before meals, daily "family worship" in which each of us, even small children, were expected to take a turn praying, individual daily devotions, lots of scripture memorizations, and extemporaneous, individually created prayers whenever circumstances called for it--illness, setting out on a road trip, praying before guests left, upcoming events, financial needs, and so on. 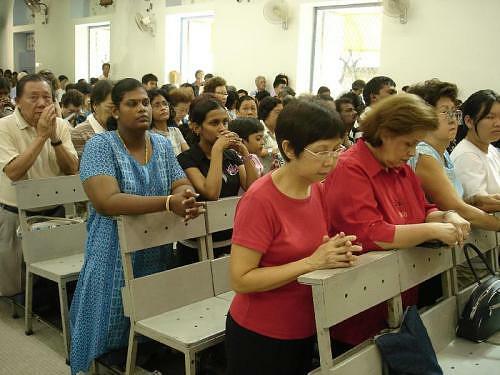 At church, we had a fairly lengthy prayer (by the minister, usually) in each service, opening prayers for special events or services, and of course, mid-week prayer meeting when everyone could pray in turn (or sometimes individually yet all at once), kneeling by the pews. At school, we all repeated the Lord's prayer and listened to a scripture each morning, at least until it got phased out when I was in grade 9 or so, when we were on "shift system" and there just wasn't enough time in a 4 hour school day to include "extras." Soon enough, schools stopped doing morning prayers altogether. Overall (excepting school prayers), the emphasis in the evangelical tradition I was raised in was on personal requests--for health, safety, finances, guidance. But we didn't often use Scripture as a prayer or guide, other than the Lord's Prayer and sometimes scripture in prayerful hymns or choruses, through which I suppose we felt we were covering "praise" and "seeking God" and "worshipping." Very occasionally, we would have a "responsive reading" from the back of the hymnal, a leftover from our denomination's Wesleyan and Anglican roots, I imagine. There was a simple liturgy of prayers, about once a month, for communion, spoken by the minister. We didn't, so far as I know, draw upon other traditional prayers passed down through the church ages, nor did we use any of the creeds. I was 12 years old when I first heard of the Apostle's Creed, which we had to memorize for a badge in our church's children's club. No context, no use of it in our services, so I just memorized it and got my badge, with no idea where it came from or understanding of its significance. Oddly enough, I didn't think to ask anyone about it; mind you, I don't think we did a lot of "asking" about things like that. There were some prayers in the denomination's "Book of Discipline" in the section on rituals such as infant dedication, baptism, and so on--but again, these were read by the minister and were not in that sense congregational/ participatory. In a sense, the hymns we sang (and we sang many) were our congregational prayers. And worthy ones, at that. Happy and joyous, deep and repentant, even militant (which at that time no one questioned). The hymn book was our "liturgy" I think, along with our informal but quite religiously followed "order of service" as laid out in the weekly bulletin. In fact, I didn't know what a liturgy was until I was at least in my late teens; I'd heard the word kind of whispered in "tut-tut" discussions of how "those mainline churches, and Catholics" worshipped. At any rate, I wonder if maybe when we gave up hymns and hymn books, for the most part, and replaced them with "worship choruses" on overhead projectors, if we really did lose an important part of our worship--in fact, our liturgy, though we'd never have called it that. The hymnal teaches and inspires. It expresses faith, hope, and love. It voices our experience and aspiration. It is a way to share. It is a rich source of biblical theology. It is where we join with the saints of other centuries in a common expression of joy, praise, and worship. It is a force for unity. It is a stimulus to Christian action and evangelism. It leads us to God and to men. The combination of lyric and melody fastens truth upon the inner man. Sounds rather like a description of liturgical books like "The Book of Common Prayer," doesn't it--although I still wish we'd had more participatory focus on scripture reading and congregational prayers. More emphasis on the "deep things" of common/ congregational worship. Still, I'm glad to have discovered some of those possibilities of prayer now, even if it's been a long journey to get here.